Creative's Signature Series speakers are the company's flagship products, and with good reason. The D5xm soundbar and DSxm subwoofer combo here is brilliant in almost every respect. No AirPlay, though. Creative's Signature Series speakers are the company's flagship products, and with good reason. 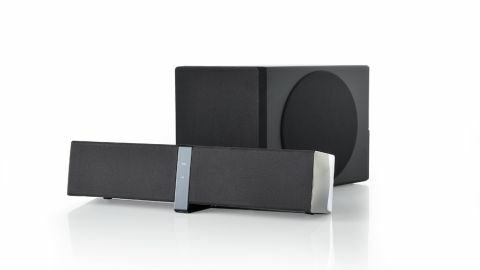 The D5xm soundbar and DSxm subwoofer combo here is brilliant in almost every respect. The D5xm is the first wireless soundbar speaker to offer room calibration, a feature usually associated with high-end hi-fi and home cinema systems. Calibration has the effect of adjusting the output of the speakers so they suit the size and shape of your room. Download the free Creative Central app, pair your iPhone or iPad with the D5xm via Bluetooth and then enter the app's Room Calibration mode. This gets the soundbar (and subwoofer, if connected) to send out a series of tones that are picked up by your iOS device's microphone, with the app adjusting the speakers' output accordingly. We only noticed the occasional dropout over Bluetooth, but you also have the option to listen using the analogue audio input too. The only low point is lack of AirPlay support, but when a sub/ sat combo is as good as this, that's a minor quibble.